Family members of United States Military members are displaying United States Service Flags again, something rarely seen since World War II, to honor family members who are members of the United States Military, during the "War on Terrorism." The Service Flag was first (unofficially) used during World War I. The flag is white with a red border and one or more blue stars in the center: one star for each family member serving in the military during times of war or hostility. If a service member dies, the blue star is covered by a gold star. At one time, states had laws on the books which described specific specifications for up to 10 different kinds of stars, indicating Prisoner of War (POW), or Missing in Action (MIA), and other statuses. However, the only design that ever found much favor with the American public was the basic design of blue stars, with gold stars overlaid to indicate the member died on active duty. In 1967, the United States Congress Codified the Service Flag, specifying who is authorized to display the flags, and requiring a license granted by the Department of Defense for the manufacture and sale of service flags and lapel buttons. (a) Individuals Entitled To Display Service Flag. (b) Individuals Entitled To Display Service Lapel Button. (c) License To Manufacture and Sell Service Flags and Service Lapel Buttons. A service lapel button approved by the Secretary may be worn by members of the immediate family of an individual serving in the Armed Forces of the United States during any period of war or hostilities in which the Armed Forces of the United States are engaged. Any person may apply to the Secretary for a license to manufacture and sell the approved service flag, or the approved service lapel button, or both. Any person that manufactures a service flag or service lapel button without having first obtained a license or otherwise violates this section is liable to the United States Government for a civil penalty of not more than $1,000. Along with the Certificate of Authority, the Institute of Heraldry will also supply drawings and instructions for the manufacture of Service Flags and/or Lapel Buttons. The Secretary may prescribe regulations necessary to carry out this section. As required under the law, the Department of Defense has published specific guidelines for the design and display of service flags and lapel buttons. These instructions are contained in DOD 1348.33-M, Manual of Military Decorations and Awards. 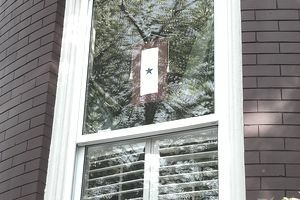 The Service flag may be displayed, in a window of the place of residence of persons who are members of the immediate family of Service members serving in the Armed Forces of the United States during any period of war or hostilities in which the Armed Forces of the United States may be engaged, for the duration of such period of war or hostilities. "Immediate family member" is defined as: wife, husband, mother, father, stepmother, stepfather, parent through adoption, foster parents who stand or stood in loco parentis, children, stepchildren, children through adoption, brothers, sisters, half brothers, and half sisters of a member of the Armed Forces of the United States. Unfortunately, the definition does not include grandparents. The Service flag may also be displayed by an organization to honor the members of that organization serving in the Armed Forces of the United States during any period of war or hostilities in which the Armed Forces of the United States may be engaged, for the duration of such period of war or hostilities. "Organization" is defined as group organizations such as churches, schools, colleges, fraternities, sororities, societies, and places of business with which the member of the Armed Forces of the United States was or is associated. On a white rectangular field a blue star or stars within a red border. The number of blue stars shall correspond to the number of Service members from the "immediate family" who are symbolized on the flag. The flag horizontally displayed shall have the stars arranged in a horizontal line or lines with one point of each star up. The flag may also be displayed vertically. If the Service member symbolized is killed or dies while serving, from causes other than dishonorable, the star representing that individual shall have superimposed thereon a gold star of smaller size so that the blue forms a border. When the flag is suspended, as against a wall, the gold star shall be to the right of, or above, the blue star. Instead of using a separate star for each Service member, one star may be used with the number of Service members indicated by Arabic numerals, which shall appear below the star. If any Service members are deceased, as determined under the circumstances cited above, a gold star shall be placed nearest the staff, or above the blue star in the case of a flag used in a vertical display. Below that star shall be the Arabic numerals. The gold stars in both cases shall be smaller than the blue stars so that the blue shall form a border. The numerals in all cases shall be in blue. States, the Service flag shall be of approximately equal size, but never larger than the flag of the United States. The flag of the United States shall occupy the position of honor. When the Service flag is displayed other than by being flown from a staff, it shall be suspended either horizontally or vertically. Users are cautioned against the use of the Service flag for advertising purposes. It shall not be embroidered on such articles as cushions, handkerchiefs; etc., printed, or otherwise impressed on paper napkins or boxes or anything that is designed for temporary use and discarded; or used as any portion of a costume or athletic uniform. Advertising signs shall not be fastened to a staff or halyard from which the Service flag is flown. DOD has designated the Department of the Army as the controlling agency permission to manufacture and sell service flags and lapel buttons. The shades of colors used in the flag and the relative proportions shall be in accordance with manufacturing instructions furnished to licensed manufacturers by the Department of the Army. Applicants desiring to enter into the manufacture and sale of the Service flag or the Service Lapel Button should address applications to the Director, The Institute of Heraldry, 9325 Gunston Road, Suite 112, Fort Belvoir, VA 22060-5576. A certificate of authority to manufacture and sell the Service flag or the Service Lapel Button shall be granted only on an agreement in writing by the applicant that he or she shall not deviate in the manufacture or sale of the approved official Service flag or Service Lapel Button, as described in the DOD Manual. Drawings and instructions for the Service flag and the Service Lapel Button shall be provided to manufacturers with the issuance of their certificates of authority. The Gold Star Lapel Button is made up of a gold star 1/4 inch in diameter mounted on a purple disk 3/4 inch in diameter. The star is surrounded by gold laurel leaves in a wreath 5/8 inch in diameter. The opposite side bears the inscription, "United States of America Act of Congress, August 1966," with space for engraving the initials of the recipient. During World War I, World War II, or any subsequent period of armed hostilities in which the United States was engaged before July 1, 1958, and anytime after June 30, 1958. While engaged in an action against an enemy of the United States. While serving with friendly forces engaged in an armed conflict in which the United States is not a belligerent party against an opposing armed force. The Service Lapel Button shall be a blue star on a white rectangular field within a red border, 3/16 inch x 3/8 inch in overall size. The shades of colors and the detailed dimensions shall be in accordance with manufacturing instructions furnished to licensed manufacturers by the Department of the Army. The blue star of the Service lapel button worn by members of the immediate family shall signify that one or more Service members are serving in the Armed Forces of the United States under the conditions specified above, for service flags. Multiple blue stars are not authorized on the lapel buttons. A person eligible to wear the Gold Star Lapel Button described above, may wear the Service lapel button in conjunction therewith, if that person is also entitled to wear the Service Lapel Button (i.e., still has a living immediate family member serving in the armed forces during periods of hostility). A gold star is not authorized as part of the Service Lapel Button. There are several places online where one can purchase service flags and lapel buttons. Remember to check to make sure the manufacturer has been authorized by DOD to manufacture and sell these items.